Lol, I cannot believe it has been this long since I posted. I have been busy. Besides picking here and there and painting furniture, there were the holidays, a project I forgot to take pictures of, babysitting, and working on a fitness plan. I've decided to commit to living a long life in order to annoy my children, lol! I haven't experienced a huge weight loss, but I feel great and ride my exercise bike for 45 minutes a day and have begun a kettle bell work out also. I was asked to re paint this cute little chair for a nice young family. I did another chair right before Christmas for them also. Removing all of the paint from the nooks and corners was a bit challenging. It also needed a little bit of repair. 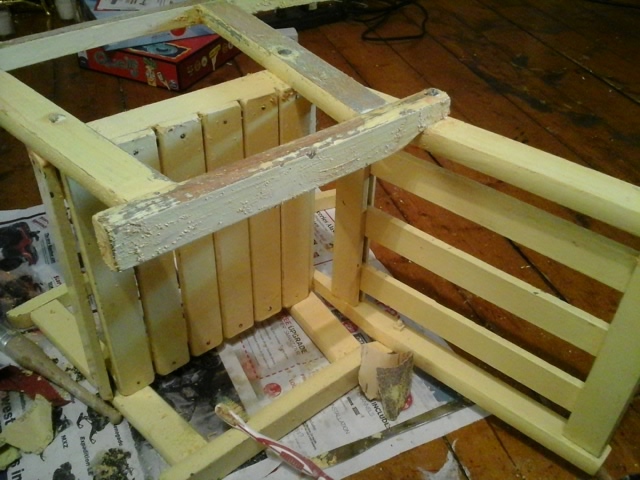 Three coats of paint and some polyacrylic and it will be ready to deliver this week. 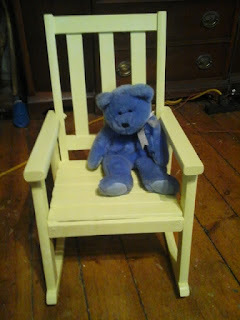 On some of these older pine pieces it is a it difficult to get a smooth finish, but it is a sturdy little chair with a nice new paint job and the family hopes to keep it and love it for years. I was beginning to think you would never get off that bike and write a post. the chair is adorable - love that color. Lol! If I could only do both at one time, that would be a workout!! Thanks, Donna! The chair is so cute! Thank you so much! I delivered it last night, the family is hoping to keep it and pass it down! Love this sweet little chair! Thank you so much for sharing @Vintage Charm!